Achieve a grand and truly decadent look in your home with the stunning European designs of this traditional collection. This collection offers a variety of exquisite features such gracefully curved exposed wood arms, hand carved wooden frames and base panels on each piece highlighted by gold accents with plush, comfortable cushions and accent pillows. Exceptional craftsmanship is apparent in the stunning details of each piece. With the available sofa, love seat and chair, you can create the seating combination that best fits your interior needs. Every detail on these pieces exudes elegance and sophistication. Ornate and unique accent pillows complete this collection along with the soft, comfortable seat cushions which add color and texture to the composition. The shapely curves and exquisite details of this stunning collection are sure to enrich your home with elegant style and design. 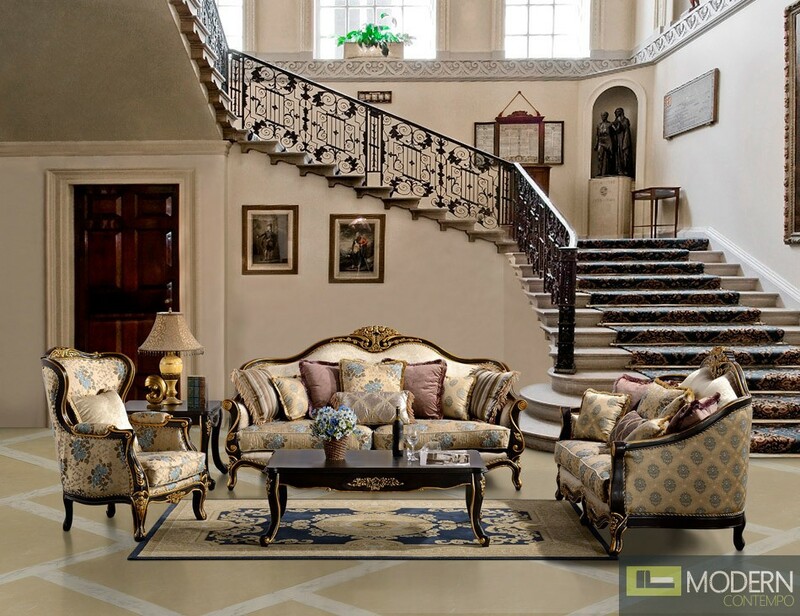 The exquisite style of this beautiful sofa set is sure to enhance the look of your traditional formal living room. Luxuriously patterned loose back pillows create a distinctive look, while the deep, plush seat cushions support you in lavish comfort and extraordinary style. The intricately hand carved solid wood frame is accented with hand applied gold tipping and outlines entire set from the exposed wood arms, around the base and over the seat back for an exquisite style that is sure to impress. Carved wooden feet add a decorative touch. Add this regal piece to your living room to create a warm and stylish space that everyone will admire.